"A cool summertime salad with ingredients from the Pacific rim. The salad has fresh herbs and a rice vinegar dressing. This salad can be served as an appetizer or a side dish. Use a mandolin to thin-slice cucumbers, radishes, and onion." Stir rice vinegar, sugar, and bay leaf together in a small saucepan over medium heat; bring to a boil. Whisk the boiling mixture until the sugar dissolves completely; remove from heat. Discard the bay leaf. Season with salt and pepper. Set aside to cool. Spread cucumber and radish slices onto a layer of paper towels. Sprinkle sea salt over the cucumber and radish slices. Set aside for 10 minutes. Rinse under cold running water and pat dry with paper towel. 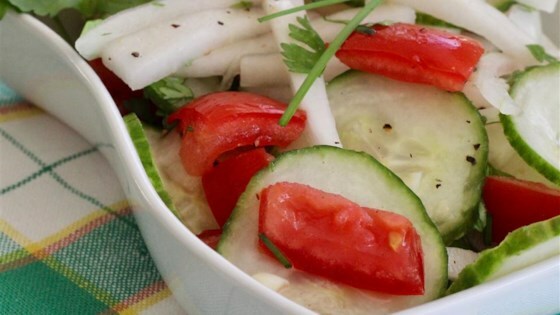 Toss cucumber, radish, sweet onion, tomatoes, chives, cilantro, garlic, and white pepper together in a large bowl. Drizzle rice vinegar dressing over the salad; toss to coat.